Why Become a Junior Ranger? This is an overview of the Junior Ranger Program in Yellowstone Park which kids complete while their families are visiting Yellowstone. There are two programs for youth; one for 5 – 7 year olds and one for 8 – 12 year olds. The program for the 5 – 7 year olds contains seven activities. The program for 8 – 12 year olds has ten different activities, both of which are completed as your family is visiting Yellowstone National Park. Worksheets may be obtained at any Y.N.P. Visitor Center. When you have completed the worksheet, just take the completed worksheet to ANY Y.N.P. Visitor Center and the park ranger on duty will ask a few questions and then will present you with your Junior Ranger Patch! 1. Welcome to Yellowstone – A paper trail of Yellowstone’s plants and animals. 2. Great Geysers! This page explains how geysers work. 3. Animals Everywhere – A puzzle/maze with 20 animals in it and you must find 10. 4. What Did You See? – A page with Yellowstone wildlife and information and questions about them. 5. Yellowstone is Habitat – Information about the different habitat in Yellowstone, mountain slopes, forests, grasslands, and rivers, ponds and lakes. 6. You and Yellowstone – Pretend you are taking pictures of your favorite sight, animals or places and draw them in the photo frames on the page. 7. Yellowstone Map – Trace your route in the park and the places you and your family visited. 1. Attend one Ranger Program. 2. Hike one of Yellowstone’s trails. 3. Know why rules are important. 5. Show on the map provided in the program where Yellowstone is located. 6. Show on a map provided in the program the roads you have traveled and where you have stopped. Youths 8 – 9 years old must complete four pages of activities. Youths 10 -12 years old must complete six pages of activities. 1. You are Here – A Yellowstone map to look at the park, and help plan your trip. 2. Your Yellowstone Journal – A page to keep a record of your trip. 3. The Big Picture – Greater Yellowstone Ecosystem Word Puzzle. 4. Healthy Habitats – Yellowstone habitats – Grasslands, Aquatic/Wetlands, Forests and Mountain Slopes. 5. Reading Tracks – Different animal tracks that you can find in Yellowstone. 6. Bear Country – Information about the black and grizzly bears in Yellowstone. 7. Wildlife Watch – Learn about Yellowstone wildlife and keep track of what you have seen. 8. Wildland Fire – Learn about wildland fires and their place in our natural world. 9. Letting Off Steam – Learn about how geyser work and Yellowstone geysers. 10. Hot Spots – Hot Spots! Word Puzzle. Learn about hot springs, geysers, mud pots and fumaroles. 1. Attend at least one ranger/naturalist activity – talk, tour, a campfire program then write a short essay on what the program was about (wildlife, bears, wolves, plant life, etc.) and have the ranger sign the page. 2. View one visitor center or roadside exhibit and tell about it. 3. Take a walk on any self-guided or other park trail. 4. Read and understand the Junior Ranger Pledge. 6. Answer three questions from the eight small paragraphs on Yellowstone. 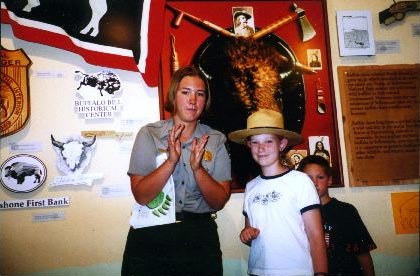 When you become a Yellowstone National Park Junior Ranger, you become a Junior Ranger in the oldest national park in the United States. Today you may be one of three million visitors who come each year to see Yellowstone’s natural beauty. As a visitor today, you share Yellowstone’s 2.2 million acres with its wildlife, and you have the opportunity to help protect its natural wonders for future visitors. By becoming a Junior Ranger, you recognize that Yellowstone National Park is important for both people and wildlife. One animal that lives in Yellowstone, and depends on the park for its future survival is the grizzly bear. That’s why the track of the grizzly bear is one symbol of the Junior Ranger program. As grizzly bears lost most of their habitat across the United States to early settlement, they retreated to remote, wild places like Yellowstone. The bear is the animal that most people want to see in Yellowstone, but the bear often stays hidden from people. The secretive grizzly bear symbolizes all that is wild in Yellowstone. The bear lives here — roams, feeds and has its young — and we’re lucky to share its wilderness. As long as Greater Yellowstone is preserved, grizzly bears and other animals that depends on this rich habitat will survive. As a Junior Ranger, you know as long as you care about Yellowstone, you can help protect its future! We hope you’ll become a Yellowstone National Park Junior Ranger, and we hope you enjoy your visit in Yellowstone!